Offshore wind turbines: hurricane tamers? We all have heard about how our economy depends on burning fossil fuels for the production of energy. This is wreaking havoc in the planet’s atmosphere, contributing to global warming, which at the same time, increases the rates of incidence and potency of natural disasters like hurricanes. Imagine if we could find a way of replacing those nasty fossil fuels with clean energy, AND at the same time, prevent the loss of billions of dollars in damage. It would be amazing, huh? Turns out it seems there is such an elegant solution. Stanford University researchers published on 02/27/2014 a study called “Taming hurricanes with arrays of offshore wind turbines”, where they present the idea of offshore wind turbines not only as a source of cheap, abundant and clean energy, but as hurricane mitigators as well. To put things in perspective, Hurricane Sandy caused around 82 billion in damage to three US states back in 2010. On of the current solutions for protecting cities from storm surges are sea walls, which cost around $10-29 billion dollars for one city. These researchers built a computer model that would simulate what would happen if a major hurricane, like Katrina or Sandy, collided with a large offshore wind farm made up by thousands of wind turbines (around 300+ GW installed capacity). And found pretty interesting results. This sounds really good, but we all know that idealism isn’t a good thing. The question is, would this kind of wind farms be economically feasible? And the answer is yes. 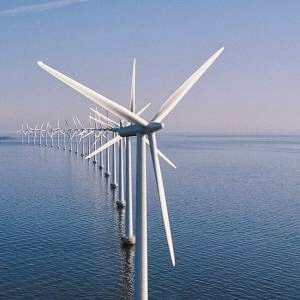 In the study, they compare the cost of offshore wind turbines with the cost of sea walls. They found that if we consider the turbines only for its returns in dissipating hurricane impact, sea walls would be more economically efficient, but sea walls only have that one function. When we also consider the huge gains of the electricity generated by the turbines, the turbines are a much more cheap solution for mitigating hurricane damage than sea walls. They also compared the cost of kWh of the energy produced by offshore wind turbines with the cost of kWh of the energy produced by new fossil fuel generation. The average historical cost of offshore wind energy has been about 19 cents per kWh, while the average cost of new fossil fuel generation estimates to around 10 cents per kWh. But, the 19 cents cost did not take into account elements like damage avoidance, reduced pollution and health and climate costs. Taking these into consideration, the average cost of kWh of the energy produced by offshore wind turbines significantly falls to around 4-8.5 cents per kWh, which is less than the cost of kWh of the energy produced by new fossil fuel generation. With technology rapidly advancing and new discoveries being made, it’s reasonable to think that offshore wind energy generation costs will go down in the future. I love the idea of coming up with elegant solutions like this one that take advantage of the synergy that can be achieved by well though systems. It’s one path, and two works. Mauricio studies Earth Science at the UNAM in Mexico City.